Along a heavily trafficked portion of Archer Avenue on the city’s Southwest Side, the Garfield Ridge branch of the Chicago Public Library anchors a corner site. The single-story facility is marked by its use of a single horizontal window that stretches nearly150 feet from the corner to the center of the facade, which visually directs visitors to the entrance. The Prairie style horizontality is exaggerated and expressed in every detail with signage, planter boxes and masonry coursing. Inside, a sloped wall guides patrons into the main space that enfolds the children’s section within a gentle curve. 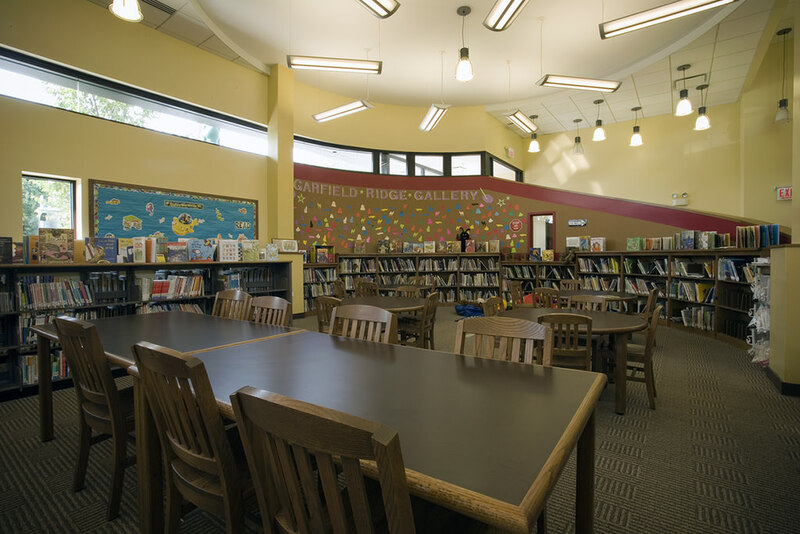 Diffuse natural daylight and inviting gathering spaces create intimate spaces within this neighborhood branch library.